I'm trying to map ⌘+Delete (backspace) to delete to the beginning of the line (like it works in browsers and text editors) in iTerm2 and I'm unable to find a working escape code for it. I tried 1K (^[1K) based on what I read in Wikipedia. It just prints a "K". Edit: I found Ctrl+U. Now to find out how to map it. Maybe Hex code 21 (U being 21st letter), so 0x15? I was able to find that Ctrl+U does nearly the exact task I want (it deletes the entire line rather than deleting only what is before cursor, but whatever... Ctrl+Y as a bonus can bring it all back). Then I curiously saw that I had hex codes 0x1 and 0x5 mapped to ^A and ^E respectively, for my Cmd+Left and Cmd+Right... so 0x15 is for ^U! as by default ZSH doesn't map backward-kill-line to anything. I had test for it, and it is correct. this delete one word, not a line. In OSX, ⌥+⌫ and ⌘+⌫ are the shortcuts for deleting a word and deleting a line respectively. ⌘+ ← and ⌘+ → are for going to the beginning and end of lines. 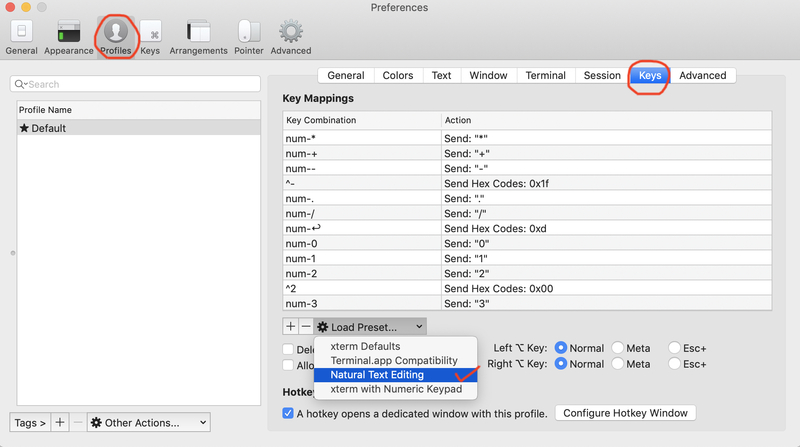 By default, iTerm2 isn't configured this way, and there are a lot of misleading guides online. The following is what I've found to work on my machine. 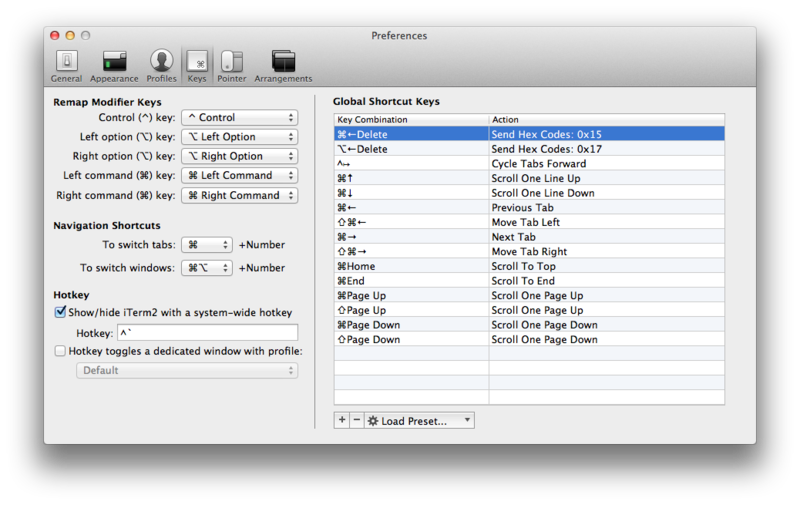 Open the preferences (⌘+,) and go to the Keys tab. Moving to the beginning of the line: 0x01. Moving to the end of the line: 0x05. Just open a new tab, and it should work! As pointed ^U deletes the line. You can easily remap the command by using Better Touch Tool. It also has cool features for automation, mouse, pad and keyboard mapping. Also includes a window feature for smart borders. Not the answer you're looking for? Browse other questions tagged macos terminal iterm2 or ask your own question. Can Terminal.app be made to respect ANSI escape codes?